Itokii wireless 0-20mA current meters are capable of measuring the current off another device or sensor, up to 20mA (DC), by connecting the leads of the sensor to the positive and ground terminals of the device being measured. Examples of interfacing devices include, but are not limited to: Current transducers (CTs) with outputs up to 20 mA, pH sensor, dissolved oxygen sensor, pressure sensor, magnetic flow meters, velocity or acceleration sensors, industrial vibration sensors, industrial accelerometers, any kind of sensor that specifies the output is in (mA) within the range of 0 – 20. Superior power management provides PRO sensors with almost twice the battery life of Itokii´s standard wireless sensors. PRO products employ Itokii's new Encrypt-RF™ Security (256-bit Diffie Hellman key exchange and AES-128 CBC encryption for all sensor data messages), so security is maintained at all communication points from sensor to gateway, gateway to software, then back again. 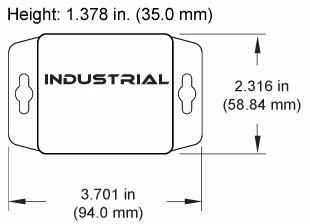 Itokii PRO Industrial Sensors come in an IP65, NEMA 4X, CE rated, sealed, and weatherproof enclosure. They are powered by a single, replaceable, Industrial grade 3.6 V battery (included). Notes: WARNING: Use caution when interfacing to the Itokii 0-20mA Current meter. Negative voltages, any kind of AC Voltages, or DC Voltage exceeding 3.6V WILL DAMAGE the electronics of the wireless sensor. Itokii is not responsible for troubleshooting, replacing or reimbursing damages incurred by disregarding this warning.